First I want to let all my faithful friends know that you can now SUBSCRIBE to my blog. Just follow the directions after you put your e mail into the upper right hand corner box and click subscribe. You won’t get junk mail but you will receive a notice that there is a new post on my blog when it happens. I have to Thank my friend Cathy Shivoitz for suggesting that I do this. I want to share with all of you THE GRACEFUL ENVELOPE CONTEST (click here to see previous years winners, and also to get rules for entering the contest). 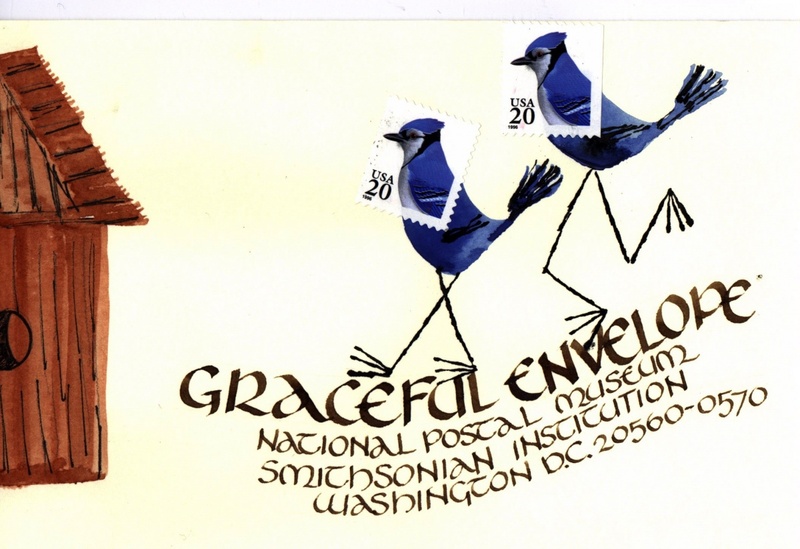 It was started by the National Postal Museum at the Smithsonian in 1995 and in the year 2001 they passed it off to the Washington Calligraphers Guild to manage. 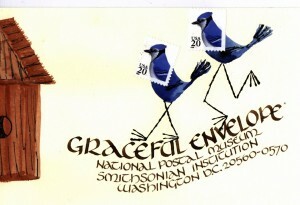 In 1999 my envelope was a winner and I have been told that it is in a notebook with other winners housed in the National Postal Museum in the Smithsonian. 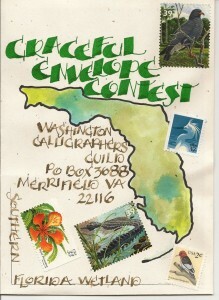 This was my winning envelope and the idea of giving the birds legs came from my good friend Nichol Rauch. I have had two other envelopes which received Honorable Mentions. The first one is from 2005 and the theme that year was A MAILABLE FEAST… I immediately thought of Hemingway and his Moveable Feast. I had previously carved a rubber stamp of Heminway so thought that would work on the envelope and the postage stamps of fruit, veggies and chocolate made me think of having the ants carrying the stamps of food from their nest. As you can see I am not good at drawing so my ant nest is nothing to get excited over and the ants were commercial rubber stamps as was the image of the Eiffel Tower which I used up near the actual postage. The lettering Script was Bone, of my favorites. Then this past year, 2011, I again received an Honorable Mention. 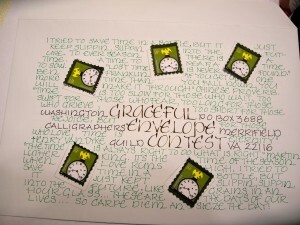 The theme last year was Time and again I was inspired by the 10 cent Time postage stamps. I used a new size envelope which was 6×9 so I had to have a lot of stamps on it and I took it to my local (Ft. Myers) post office and got one of my postal employee’s to help me with telling exactly how much postage to put on it. It is currently on display in the National Association of Letter Carriers headquarters building, National Association of Letter Carriers headquarters building, in Washington DC. A couple of my friends here if Florida decided we should go to see it so we are currently planning a trip to DC. 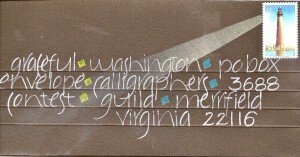 (pictures later) I again used Bone for title and a pointed pen variation for the address. I drew the clocks on and also the hands and numbers. Ok by now you are going ‘wow’ she is really into this and you are correct. I really enjoy trying to come up with ideas for the theme and also trying to incorporate postage stamps that go with the theme. 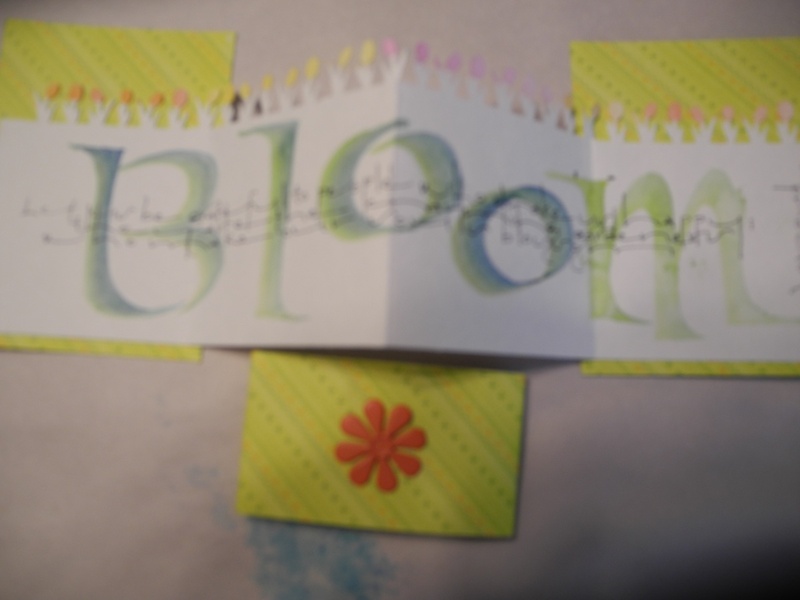 Last year I had more than one idea as I have had in the past and the rules are you can only send one envelope so sometimes I have several ideas going at the same time and then have to decide which one I will send. This was my other idea for last year and I covered the envelope with words, quotes and songs that use the word time. 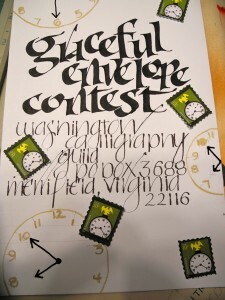 I couldn’t decide which to send so I show them to a few calligraphy friends and asked which one they liked best. They were torn also but finally I decided on the Bone/Pointed pen version. Apparently it was a good choice. The others here are ones that I sent over the past few years that didn’t win or receive Honorable Mention but that’s ok because I really like doing this and love the challenge that it gives me to put on my thinking cap and play with my letters. This one was for the theme Nature and I don’t remember which year. The funky lettering style was again one shared to me by Nichol Rauch..and I loved it. I drew the state of Florida and used tropical postage. I liked it but there were others that were better so not a winner. Then I did did the lighthouse one and again I tried something really different I used chalk pencils for the lettering on dark envelope. I also embossed the lines for writing. I loved having the the light shine from lighthouse but it was also not a winner. Still I was pleased with the effect. So the bottom line is you may not always win but its always fun to participate. 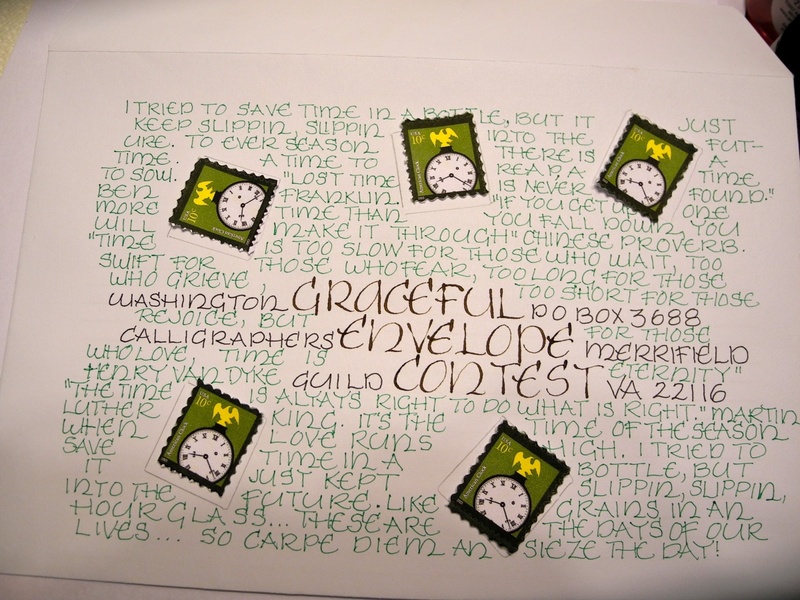 If you go back to the beginning of the blog you can click on Graceful Envelope Contest and see past winners as well as find the rules and guidelines for this year. I would like to encourage you to give this a try. Just to give yourself a challenge and to play with all those pens, papers and inks we all have. I am sure some of you are wondering ‘what do you win?’. Well, you will receive a lovely letter with an image of your envelope on it that lists you either as a winner or an Honorable Mention. I am not going into all the rules as they are on the Web Site. I would suggest that you always make a copy for yourself of your envelope and if you put the year and the theme on it you will be able to go back and share it better. The winners and Honorable Mentions are posted on a the web site so think of it as your 15 minutes of fame. Don’t forget you can now subscribe to my blog thanks to my friend Cathy Shiovitz who suggested this. It’s up in the upper right hand corner and then every time I have a new post you will get an e mail so that you don’t have to check every day. Thanks Cathy what a great idea. ART DECO style lettering has been a passion of mine for several years. I love the old posters from the 1920’s and 30’s. In fact probably most of the the monoline lettering that I have taught or used myself is some variation on a mono line style of typeface. The one I choose here is a based loosely on a style by MIG from 1903. My dear friend Jo Forsyth shared it with me back in the fall sometime and I have been playing with it ever since, used it on my Christmas cards this year and probably should have practiced a little more before I tried it, but I just couldn’t wait. You will recall from the AKIM CURSIVE that I suggested you can use any type of pen that works well for you but I like to give my students the option of trying to do the lettering with the same pen I used to do the exemplar. The reason for that is that some of you will work diligently to get letters that look exactly like mine. This is of course flattering but it becomes difficult if you aren’t using the same pen I used. So one of my favorite pens for practicing is the ZIG WRITER. It comes in a variety of colors and has two ends one is 1.2mm and the smaller end is .05mm. They do come in a variety of colors, they are waterproof, lightfast (non-fading),permanent (bleed proof meaning you can watercolor over them) Well what more could you ask for. Oh yeah, you can carry them on a plane and they won’t leak in your purse. The large letters were written with the 1.2mm end of the pen and the lower set were written with .05 mm end of the pen. In addition you will note that I have used Computer bar paper to practice on and there are several reasons for this. First, it’s perfect for already having guidelines ..if you use both a green bar and white bar (or some are blue and white) you have one inch letters, and if you use just a green or white bar you have 1/2inch guidelines. While I realize that most of you won’t be writing 1″ letters unless you are scrapbooking or doing a name on an envelope it is good to see the size in relation to width of the pen. If you try to write really tall letters with a very fine pen point they are going to look weak and probably wobbly so bigger letters = bigger pen point. The next reason is that you should always practice writing a new script with the largest size you can work with easily. If you start out writing very small letters to practice then its kinda like trying to learn to surf before you know how to swim. Its good to get the feel and look of the letters at a size that you can see well then when you feel you have gotten to know them better try downsizing them. Again remember to practice words…you won’t get the feel for spacing unless you try making words rather than just letters. If you want to see how consistent your letters are then turn your paper upside down …once you are not trying to read it you will see immediately if your spacing is good or bad or inconsistent. I highlights Consistent because people can often overlook poor lettering or the fact that all your e’s don’t look the same etc but if you are inconsistent with spacing and your letters its going to hit them right between the eyes. So work hard for consistency. Audition your letters ( run thru the alphabet several times so that you know you are making the correct letters. This is especially a problem if like me you use several different monoline alphabets regularly. If you have an e from this one and r from that one and t from yet another ( and this can happen because we have letters from various alphabets that are our favorites ) then it ends up looking like a band in a parade with everyone wearing a different uniform. Again that consistency thing. These letters are basically tall and narrow the widest letters are both the M and W.
The letter O is not ROUND it is Oval and rather flat on the top and bottom..you may need to practice this or even trace mine till you get your hand to obey. Go slowly this is not written quickly. 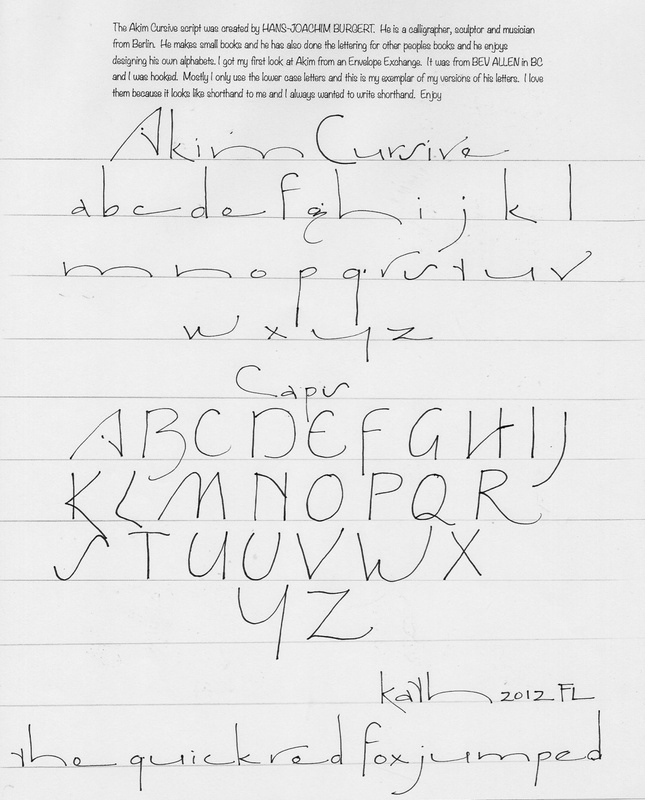 The Q I love my guess is this where that crazy cursive Q came from that always looked like a #2 rather than a letter. In any case I make it by first making a rather oval smaller o then pick up your pen and place it about half way down the left side of the bowl and make a diagonal line down to baseline then pull back for foot. Also please note that the cross bars are all curved slightly, I know this seems like a small thing but it makes the alphabet really special, I think. I also curved the cross bar on the top of T. So that means A, H, T, N…just slightly curved. I’d love to hear from you with questions or have you send me samples of your work. 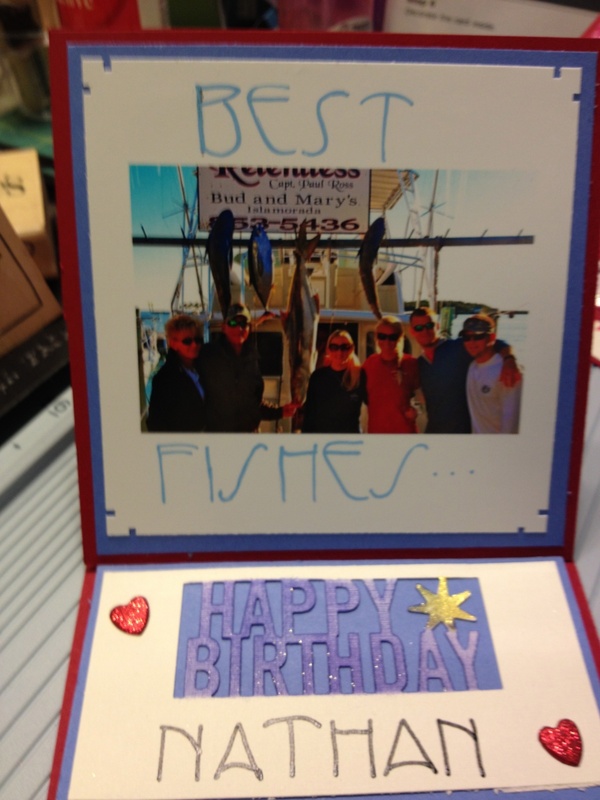 While I love getting SNAIL MAIL …you can send it digital. As always thanks for stopping by. I love reading comments good or bad. At the time, I was teaching lots of monoline classes at various stamp and scrapbooking stores. And this script was usually a favorite. I think the reason that I liked it so much is that it reminded me of SHORTHAND and I have always liked that the look, texture and rhythm of shorthand was lovely. I also liked the feel of it with regular formal letters such as NEULAND. ( a script I’ll share with you at a later date. ) 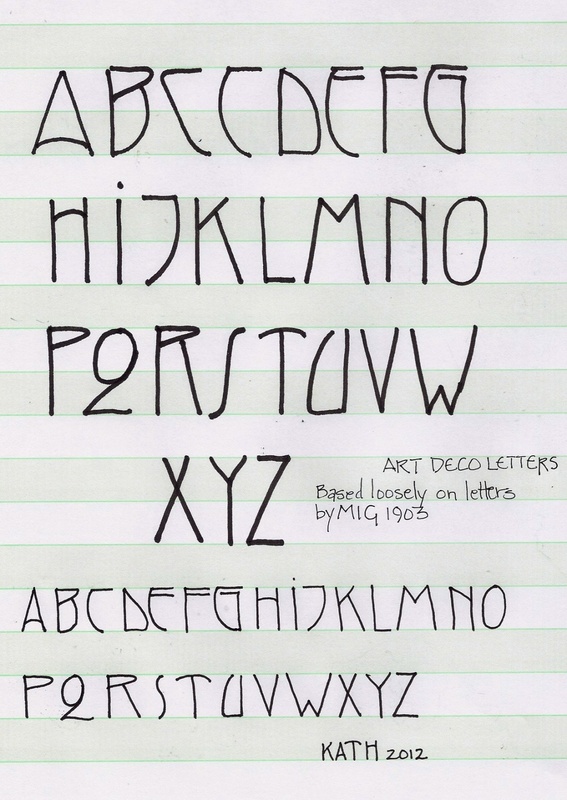 The fact that you can use any type of pen or pencil or colored pencil or even crayon and some calligraphers have even adapted it to use with a chisel nib. (formal calligraphy nib). I mentioned on the exemplar (term used to describe the example of the letters). That the letters that truly appealed to me were the lower case letter not the capitals. But I did give them both to you because I know that some of you will not be able to break away from the habit of using Capitals and frankly some of the people you may send to ( I use this a lot on Envelopes) may not appreciate it if you write their name and don’t use a Capital…again for me I generally still use the lower case letter form but write it bigger. I also like the fact that its a little difficult to read and you may find that you will adjust a few of the more difficult forms so that they do read easier. This is perfectly fine and allowing your own handwriting to influence some of the letters is fine also..the most important aspect to this script is that it is stretched. As you can see especially the m, n , h and the s, as well as the u, v, w and y. The S is the trickiest of the letters because in general we make our letters starting at the top of the letter and pulling down. With the S in this alphabet you will need to start at the bottom of the letter and pull UP and somewhat diagonal. You don’t want it laying all the way down but you also don’t want it standing perfectly up right and vertical. The T is also going to give a lot people a problem. Bergert’s version and mine is short downstroke then follow the line about half way back up and flip out to left side, it is not a complete crossbar but if that bothers you then make a complete crossbar. Just a few other hints, I like to use a fine line pen ( my current favorite is aPILOT G2 0.38 and often they are available at Walmart and almost always at Staples this site is Staples and shows buying a dozen but you don’t have to buy that many and .05 is fine as well as the 07. See what works best for you.) but as I said you can use any size, roller ball, gel pen, even fountain pen. Think that covers most of hints I wanted to share, I know this is not the same as taking a class but you might surprise yourself with your ability. 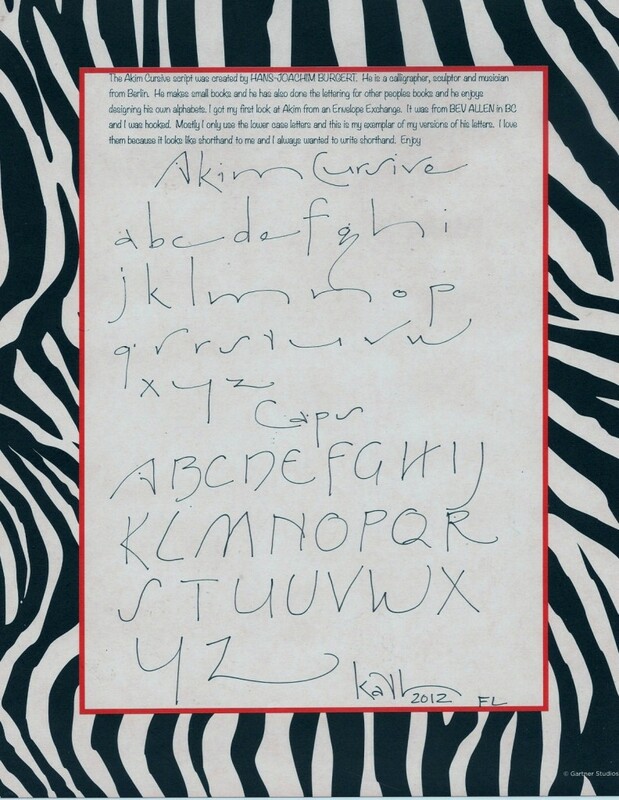 I would be glad to answer any questions you might have and I would absolutely love it if you sent me a copy of any writing that you did .. you don’t have to send your whole alphabet just a sentence or a name or quote that you may have written or any practice you might have done. That reminds me of two more hints. Whenever you are learning a new script…only write each letter 3 times then move on even if you don’t have that letter down or it doesn’t look right or look like the exemplar then go back to it later but MOVE ON...you don’t want to teach your hand to do it wrong . If you need to trace the letter off the exemplar to get the feel of how to do move your hand to make the letter. Also once you get the feel for letters START MAKING WORDS...only with words will you be able to feel the spacing, this doesn’t mean you have to do a quote write whatever is in your head, grocery list, names, rhyming words etc.. don’t make it too hard on yourself . 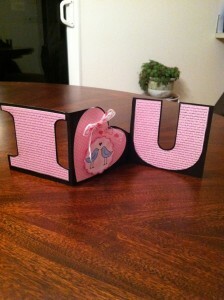 You can e mail me copies of your work and let me know if I can put them on the blog with your name. Now don’t freak at that, its not like I am putting you out there naked and I can leave your name off if you want, but sharing is what this is all about. this is a card of mine. 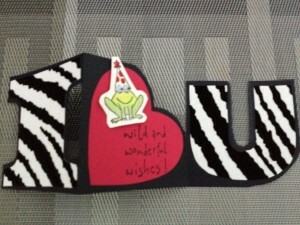 Akim with Bone letters . 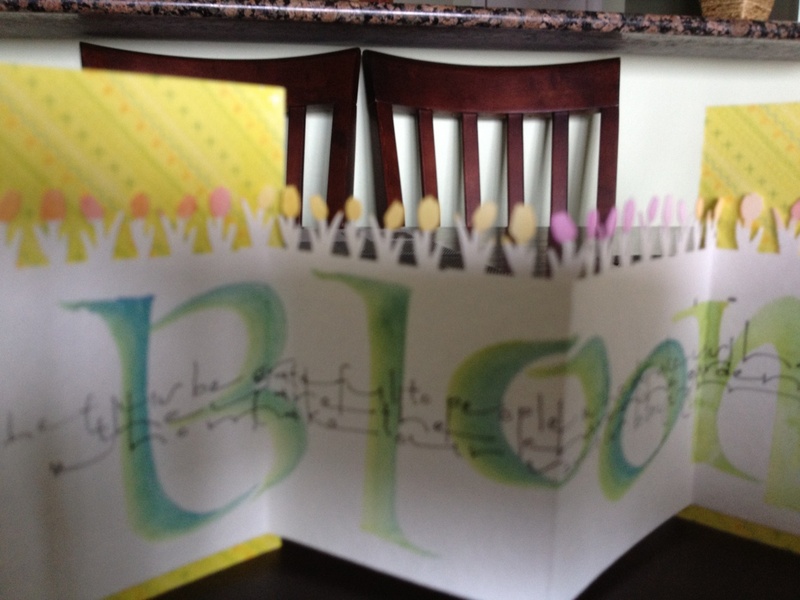 And the on the right was a card sent to me by Adelaide Dunklee. As always thanks for stopping by. How to Fold a Dollar into a Heart. ( it takes a few seconds for the image to come up and then if you click on the page it gets bigger and you should be able to go under file at top of your computer and click file then print ). First let me say that you don’t have to use a dollar bill either real or fake to make this heart you can just cut a piece of paper the size of a dollar bill and make it. The size would be 6 1/4 x 2 5/8. If you have trouble figuring out eights on a ruler then just cut it 2 1/2. This is a nice way to give a gift of money that is a little more appealing than just sticking the money in one of those money holders. And of course I thought it was kinda timely with Valentine’s day being almost on us and lots of us are not near our grandkids and sending money to grandkids is always hit. I chose this one because it is a rather easy origami fold and I love folding origami and will want to share more with you in the future so didn’t want to make you run screaming from the computer with your first effort. For those of you that would prefer a video of this rather then printed directions here is web site for YOUTUBE version. This one is slightly different but very close and she had the least offensive amount of ads. You can skip the ad at the beginning…after about 30 seconds. You know you can bookmark videos and ad them to your favorites list so that you can go back and find them again easily. There are many different folds for this heart using money so you can explore those as well. Again I stuck with the easiest version so that I would not scare off folks from trying future posts. 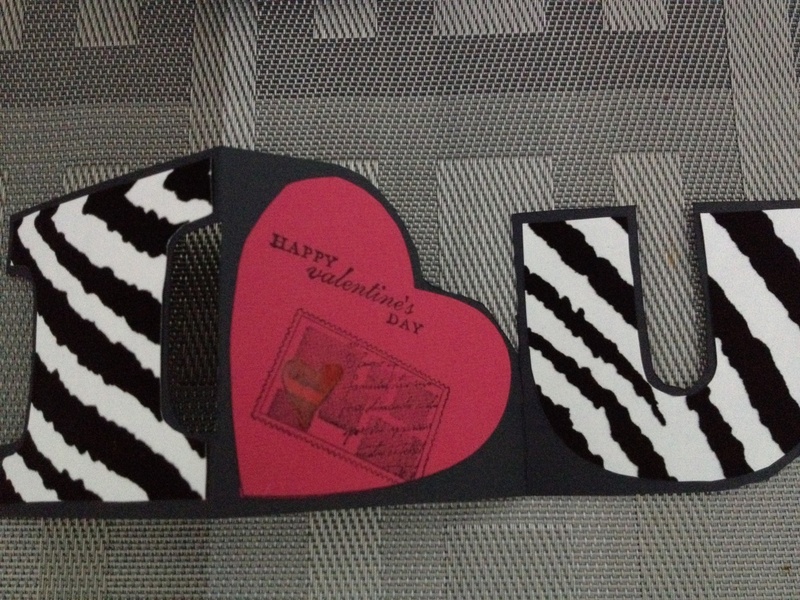 Another little tip I wanted to share was that a friend was working on the SCS I heart U card and was having trouble cutting with exacto knife and keeping it from wobbling. The best way to draw/cut a straight line is to ( this is tricky so practice a little first but once you train your eyes to do this it works great.) DON’T LOOK AT THE BLADE….defocus and look at the line you want to follow then just draw your blade while looking at /following the line you want to cut on.. see the trick is YOUR HAND CAN’T SEE…but it thinks it can but really you need to be using your eyes and if your eyes are looking at the blade they AREN’T looking where they are going…. I compare it to a waitress carrying a tray of drinks or food ..you won’t see her looking at the tray she is looking where she is going and she arrives 99% of time with no spills and no dropping the tray. 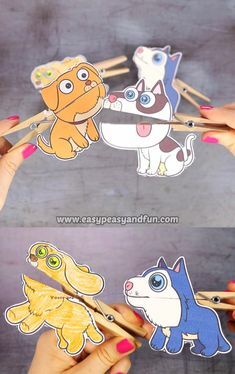 So make some lines on paper not all straight make curvy lines too and practice cutting with them. As to xacto knives ( my hubby just informed me that like zerox, x-acto is a specific brand so you need to look, if shopping on line, for utility knifes…I hate being Politically Correct.) well there are so many out there that I can’t begin to note them all I will tell you that I have been using for the last few years a version I got at LOWES because it has break away blades…that means that as your blade gets dull you can just use small pliers and snap off the old blade and bingo you have new sharp one. They have several styles and there is a small one that is not break away blades ( they say snap off) but is great for your purse just don’t carry it through security at the airport. This really comes in handy if you are off at a retreat somewhere and miles from anyway to buy new blades. But like pens xacto’s are a personal choice so find one that works for you. 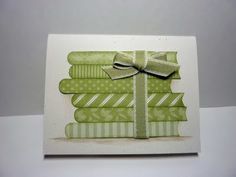 Lastly this week just a little eye candy by my WA BFF…Stephanie Goggleye…this is her I HEART U (SCS) card from the last blog. 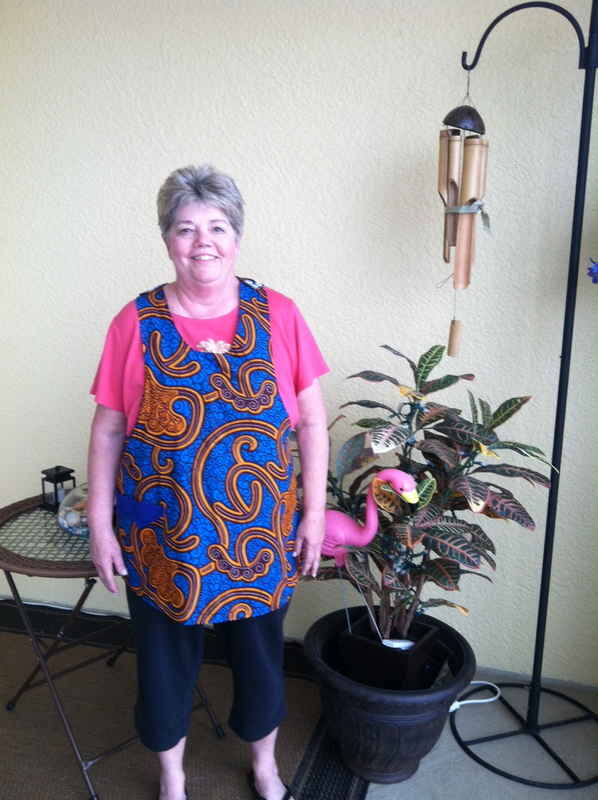 I recently commented on a friend’s apron she made using fabric she got from Africa, and suddenly my mailbox had this wonderful hand made apron out of African Fabric. THANK YOU SO MUCH CYNTHIA THOMAS. Next week I am going to give you the AKIM CURSIVE script to play with so you have some lettering styles . This Word Card is also from SplitCoast Stampers...I told you they have really fun cards. This one arrived last Wednesday and I have made several and I have a few tips and techniques to share with you before you start. Don’t forget there is a video at bottom of THEIR page. The first is that they supply you with a printable version that prints two of each letter and hearts. 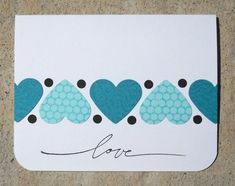 They suggest that you cut out the letters and heart and use them as templates and while you can certainly do that, if you want to use them as templates I would cut them out of old file folders so that they last longer. You can also purchase a plastic that is used by quilters for making their own quilt templates. This will really last a long time. However, my first choice and what I did was print that page directly onto various sheets of card stock. This way I am able to cut them out and use them directly saving a step and also later of hunting for the template that you cut out. I keep the full sheet in plastic sleeve and paper clipped the various letters and hearts together and dropped them into the sheet protector as well. 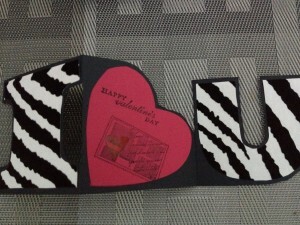 After printing several pages I then, while watching TV cut them out and paper clipped them together by letter/heart . Don’t know about you but I seem to often need a card in a hurry and this makes it so much easier. Next don’t assume that this has to be a VALENTINE CARD…of course that is the most obvious use for it but I also used it for a few Birthdays that I had coming up. 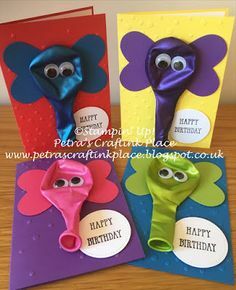 You have the heart image to stamp or write in and you can also add things like cut outs or stamps of balloons, candles, gifts, etc to either of the letters. 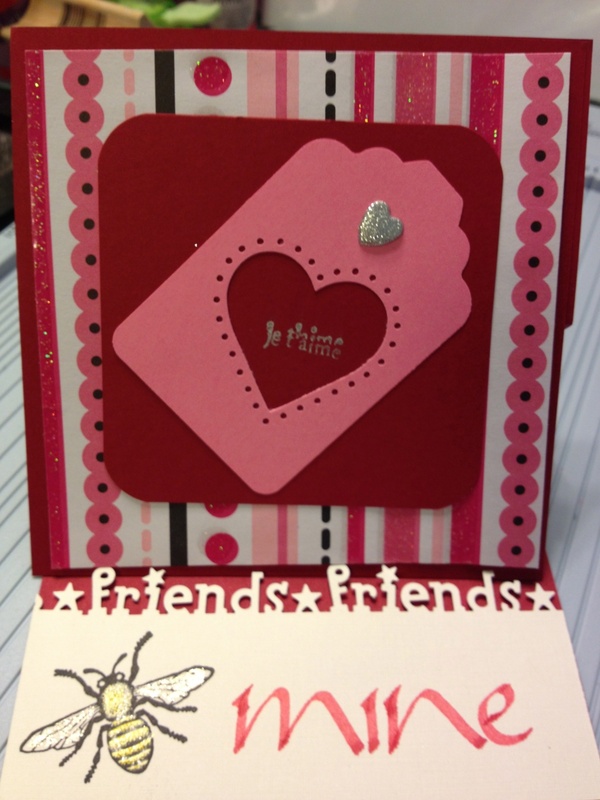 In addition you also have the ability to write a personal note on the back of the card again on the heart as that gives you the most space. 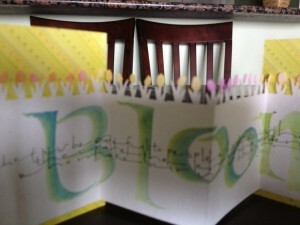 Some ideas for quotes for Birthday cards. 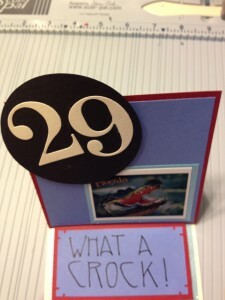 Hope this makes your HEART sing..
29…. that cracks me up…(for this one you might gently tear the heart in half diagonally and stick it down with the crack) do your lettering after you tear it to make sure you don’t tear your words. ok maybe this is enough don’t want to bore you. Two last things about this card. First I like it best on dark paper , I used black but other darker colors work as well. Second you can layer it again after cutting out with a lighter color on a 4″ x 11 strip of card stock for yet another dimension. Oh and there is no end of brads, punch outs, stickers and assorted ephemera you can put on here… if you want the brad folds not to show then put them on the letters/heart before you tape it onto the background. 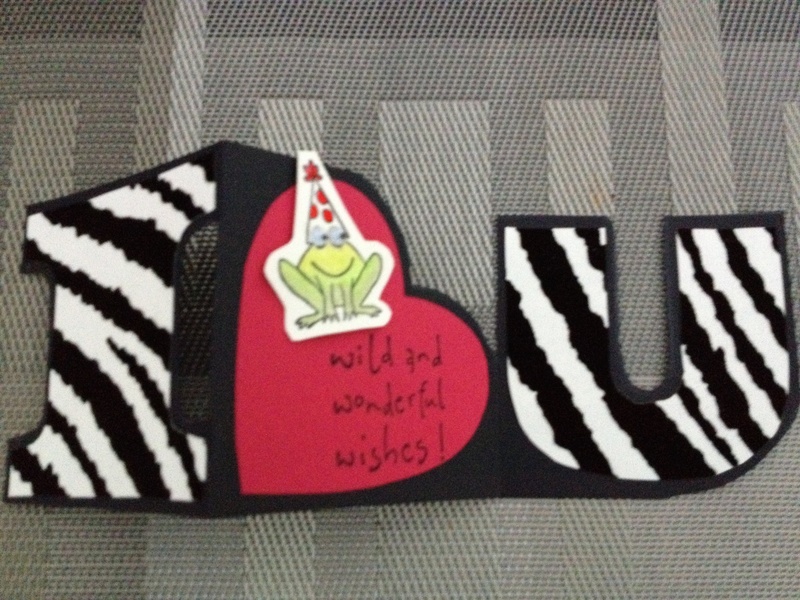 ONE MORE note on printing your letters/heart…you can use light weight card stock plain or double sided just decide which side you want to show..and this zebra stripe I used was actually text weight paper with felt on it for strips and it went thru printer just fine. If you don’t have printer/copier you can do this at Kinkos etc just ask for help in using your own paper. Most of all have fun, play and explore. 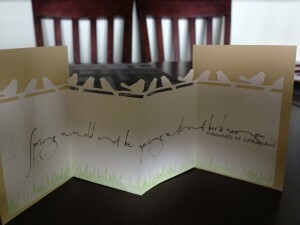 If you send me a one of your cards I’ll post them on my blog, with your name unless you ask me not to. If you need my snail mail address send me an e mail and I ‘ll send it to you. PSS.. Joann’s usually has the plastic but I was unable to link it in so I linked in the same stuff from Amazon..
INDISPENSABLES are things that are essential, absolutely necessary at least for this girl. A girl just has to have a few tools that she just can’t seem to do without. I am not telling you to run out and buy them but just wanted to share them with you in case you decide to make purchases. My first is what I think is the best paper cutter/trimmer on the market. It’s by FISKARS and comes in 3 different sizes. Unlike many of the previous Fiskars this one cuts true and straight and I think that is due to the fact that it is using a wire running down the line of the blade so you can really see where you are cutting. There are 3 versions and two of them have the arm that folds out to assist with measuring. My choice is the 6 x 12 which does have an arm that will allow you to measure 12 x 12. Amazon is a good source, but you can also try Michael’s or Jo Ann’s . 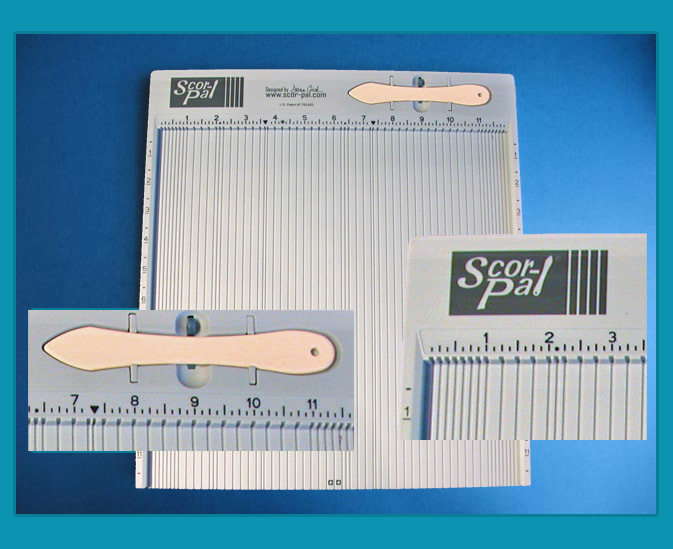 My next tool is called a SCOR-PAL..It comes in two sizes and is used for scoring cards both simple and advanced. You can also buy a self healing cutting mat that lays on the top of it to use as both a work surface and for cutting with an xacto when you are not using it for scoring. 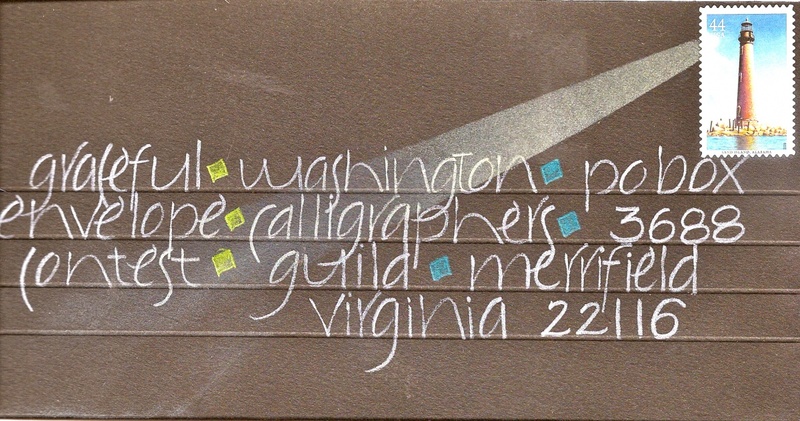 I am going to be posting card patterns from a web site called SPLITCOASTSTAMPERS and they refer to the Scor-pal a lot on their folding cards. If you are just getting started and this seems a bit too expensive, my next recommendation would be to purchase a 6 x 12 quilting ruler the thick kind so that you can cut against it as well as use it for measuring and scoring and you can see thru it so that makes the measuring a lot easier. These are readily available from Jo Ann’s Fabric and Craft. And at some point if you are using an xacto or rotary cutter you will need a self healing cutting mat. For adhesive purposes I prefer to use double stick tape or glue dots rather than glue stick and there are so many different types out there I think just find one that you like. 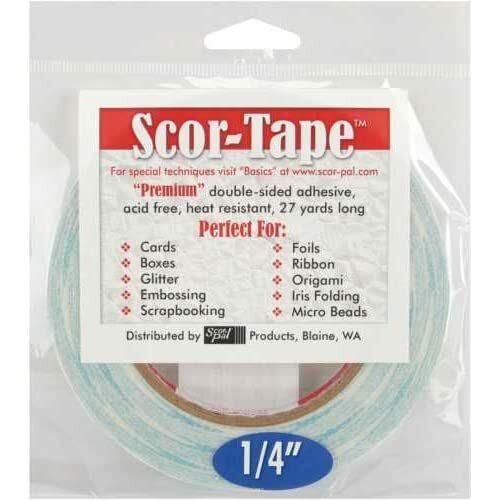 If you are doing a lot cards or scrapbooking and you find you are going thru the small ones very quickly, you may want to consider the SCOTCH ATG 700. Its a large tape gun that can lay down a 1/2 wide strip of double stick tape. Also the SCOR-PAL people make a tape called SCOR-TAPE and it comes in a variety of widths..what makes it unique is that it is a tearing rather than cutting tape i.e. you tear and stick it down and peel off the protecting strip and ta-dah..you are done. Since you have a roll tape you can make it any size. I use the 1/4in width a lot when sticking on small things. Some things though really do need glue… if you do any quilling images for cards or my favorite GOOGLIE EYES…you gotta have a glue and for that I prefer TOMBOW MULTI GLUE in a green bottle with double ends a wide one and the small tip called a Pen tip. I am not sure I have ever used the wide end but the pen tip works great. Its fast drying and holds well. Again usually available at Michael’s or Jo Ann’s. When it comes to pens… I am a total believer in SAKURA gel pens.. I love the GLAZE sets which dry clear but raised and you can layer them to make them raise even higher. The SOUFFLE sets which dry opaque and work well on dark papers. Lastly the STARDUSTsets which have a definite twinkly,glittery effect. There is also a set called Metallic and they tend to be a frosted. I find that these pens write first time, all the time and that they don’t seem to dry out…a tip…if you can store them laying flat. While most of the above items are available at Amazon, Michael’s or Jo Ann’s you may live near a stamp or scrabooking store that carries them as well. OK, think that does it for this time but I hope to post a great Valentine, Birthday card very soon. Thanks for dropping by.